I honestly don’t care for blueberries by themselves, but when you put them in muffins or cakes, they suddenly transform into these morsels of deliciousness. And that’s exactly what this dish is…light and fluffy deliciousness. This recipe is categorized as both a “Dessert” and as a “Breakfast” item. It’s really intended for breakfast I think, but it’s so sweet, it’d be great as a dessert too. I made it for my Sunday School class one morning, and they seemed to like it. My favorite part was that I made way too much so then I got to enjoy the rest of it myself! Honestly, this recipe took me quite a bit more time and effort than I thought it would, but it was WELL WORTH the effort. Just make sure you don’t try to make it the same morning that you are planning on taking it to your Sunday School class…cuz you might be a little late. Not that I’m speaking from experience or anything. Preheat the oven to 350ºF. Cream butter with lemon zest and 7/8 cup of sugar until light and fluffy. 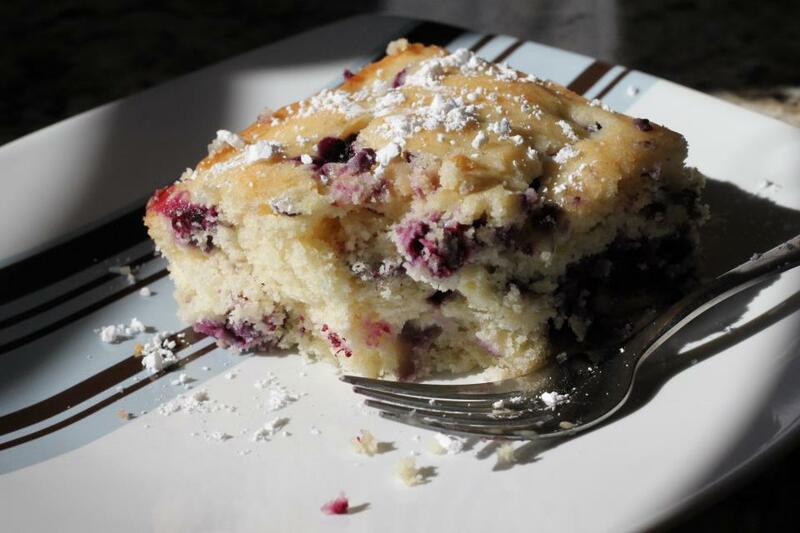 Toss the blueberries with ¼ cup of flour, then whisk together the remaining flour, baking powder and salt. Grease a 9-inch square baking pan (or something similar) with butter or coat with non-stick spray. Spread batter into pan. Sprinkle batter with remaining tablespoon of sugar. Bake for 35 minutes. Check with a toothpick for doneness. If necessary, return pan to oven for a couple of more minutes. (Note: Baking for as long as 10 minutes more might be necessary.) Let cool at least 15 minutes before serving. Thank you! If only I had some fresh blueberries growing nearby I’m sure it’d be even better! i love Buttermilk and Blueberry. Really Tasty Lindsay. I really love this amazing recipe. So delicious! Thanks for sharing.